Los SuperAvengers were formed in 2007 by Dude, Guy, & Buddy. 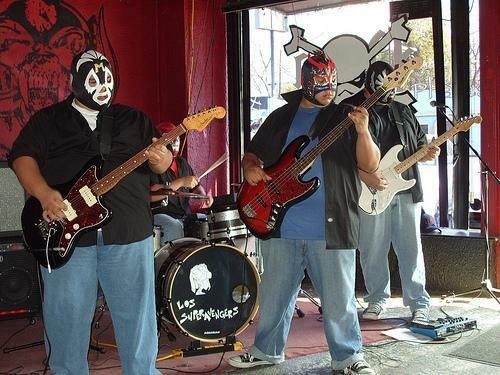 At one time Dude & Guy were former members of the once popular The SuperAvengers, a Manteca, CA, based surf-rock band. They moved to Texas, and soon after graduation began working on various music projects. Los SuperAvengers! was the end result of over half a decade of searching, auditioning, and gigging. Bringing Milo in as a Rhythm Guitarist, the band set out to play various gigs and try to make a name for themselves in the Austin music scene. They began to make progress in March of 2008 when they met Ted James, lead guitarist for The Nematoads and owner of Deep Eddy Records, and soon after began writing original music for their first album. Los SuperAvengers! began recording their first Album Perfect Wave in late 2008 and released it in June 2009 under the Deep Eddy Records label. Los SuperAvengers! are currently planning an 18 date CD release tour that will include Texas, Arizona, California, and Nevada. A spring break tour for Spring of 2010 is also in the planning stage.